SHD DVI to HDMI Cable HDMI to DVI Cable Cord DVI D to HDMI Adapter Bi-Directional Monitor Cable for PC Laptop HDTV Porjector. Good Quality and Durable HDMI to DVI Adapter Cable 3FT / 6FT / 10FT / 15FT / 20FT / 25FT / 30FT Available. 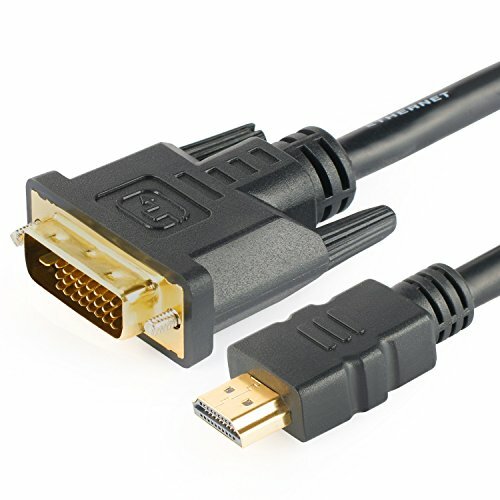 -Bi-Directional Monitor Cable: DVI >>> HDMI and HDMI >>> DVI. -Applications for Two Devices One of Them with Standard HDMI Interface and Another with DVI(24+1)/DVI(24+5) Interface,Don't Fit DVI 18+1 Port. -Easy to Installation and Easy to Use,Whatever Used for HDMI Input to DVI Output or DVI Input to HDMI Output. -Gold Plated Conductor Ensures Reliable and High Performance Data Transmission. -Hight Quality,Perfectly Support Resolution:800*600 1024*768 1280*720 1280* 960 1366*768 1440*900 1600*900 1920*1080(1080P Full HD) 1920*1200 etc. -Fit for LED/LCD Monitor,Projector,PC,Laptop,DVD,HDTV,TV Box. -99.99% Oxygen-Free Copper Conductor Ensure the High-quality Image. -Flexibility PVC Jacket for More Abrasion Resistance Durability. -Aluminum Foil Shielding for Minimize Crosstalk,Suppress Noise and Protect Against EMI/RFI. Support resolution:800*600 1024*768 1280*720 1280* 960 1366*768 1440*900 1600*900 1920*1080(1080P Full HD) 1920*1200 etc. If you have any questions about this product by SHD, contact us by completing and submitting the form below. If you are looking for a specif part number, please include it with your message.